Discussion in 'SSDs & Data Storage' started by Angelz3, Jan 21, 2019. I've been having an issue with mounting a USB drive on my laptop, and I was hoping someone could help me more than google has. Every time I attempt to "Mount in the following empty NTFS folder" on either of the drives, I get the error from Virtual Disk Manager, "The parameter is incorrect." The error does NOT say that the drive in inaccessible or anything like that. 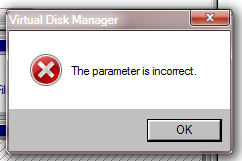 It simply says "The parameter is incorrect," and nothing more. The goal I am attempting to achieve is to mount a USB drive and place my Dropbox folder in it, so that Dropbox doesn't have to sync to my laptop's main hard drive. I was able to successfully mount a USB drive in the past, but that drive died and ever since, I have been unable to mount any drive from any of the USB ports on my laptop. 1) Running chkdisk /f /r on the drive to repair any errors. Result: No errors found. Problem still persists. 2) Reformatting the drive using the integrated Windows Disk Management interface (reformatting using NTFS for obvious reasons). Result: Reformat successful. Problem still persists. I have done extensive google searches and nearly every site/blog/etc says some variation of the same two steps I listed above and neither step works for me at all. I have not been able to mount any drive since the first time I mounted a drive on this laptop. Does anyone have any other suggestions to help me solve this issue? My guess is there are 2 partitions on the USB stick. One with some encryption software. Is there any way to check that there are two partitions? 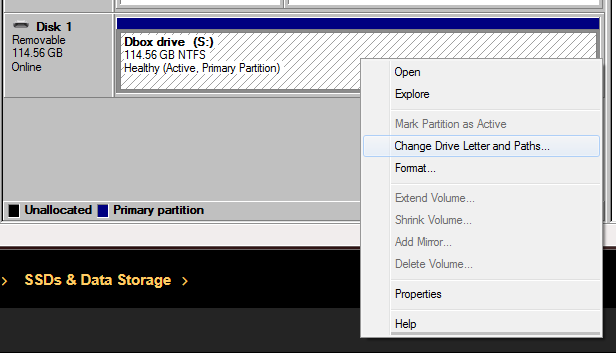 According to Disk Management, there is only one partition -- as shown in the picture below. Am I missing something? Does anyone have any ideas about my current situation? I still haven't found a solution that works. While I do appreciate your reply, the focus of my question is how to bypass those restrictions set by dropbox. In the past, I have successfully been able to virtually mount a USB flash drive and store my automatically updated dropbox files there. I simply let the USB flash drive remain in my computer at all times and everything ran smoothly until my laptop fell out of my car seat and landed on the USB flash drive, permanently destroying the drive. Ever since then, I have been unsuccessful in virtually mounting any USB flash drive. I have tried different USB brands, different USB capacities, and different USB ports on my computer, but all of them show the same message that I attached in my first post. Do you, or anyone else, have any ideas about how I could potentially solve my current inability to virtually mount USB flash drives? Let me preface this by saying this is unsupported, and can (and maybe will) lead to corruption of your data. It is a crap shoot whether it will work, depending on how Dropbox traps the info and whether they simply rely on the removable bit or query the driver more directly. What you need to do is to flip the removable bit on the device. The easy way to do this is to use the Lexar utility which makes it a single-click affair, as opposed to the long way around by hand. You can find more info here. Again, I really do appreciate your reply! I was able to virtually mount a previous (64 gb Sandisk) USB drive and use it for my dropbox files in the past. It worked perfectly, and there was no corruption of files. I understand that you would caution this method for storing dropbox files, but I personally have never had any issues with this method. My problem stems from the fact that the 64 gb Sandisk drive that I was using stopped working, because I accidentally dropped my laptop, and it landed on the USB drive which destroyed the drive. My current situation is that windows 7 is no longer allowing me to mount any USB drives. I have searched on google and found the link you mentioned prior to reading your comment. I have already attempted this method, and the Lexar utility does not work for either my 128 gb Sandisk or my 64 gb Samsung USB drives. It simply does not remove the "Read-Only (Only applies to files in this folder)" from the folders within the drive, even after re-formatting multiple times and trying the Lexar utility multiple times. I have tried mounting the drives multiple times after using I have also tried editing the drivers of the USB drives directly (the long way around by hand) but that causes my system to refuse to boot into windows until the changes are reverted. From my perspective, this issue has nothing to do with dropbox itself, and simply has to do with a flaw somewhere in my operating system or on my computer. I should be able to freely mount USB drives as I have been able to do in the past, regardless of the purpose behind my decision to mount them. Ever since my 64 gb Sandisk drive stopped functioning, I have not been able to mount any USB drives, and I am simply trying to figure out why this has happened. When you say you cannot mount any USB drives, do you mean that if you plug one in it does not get a drive letter, or that you can't assign a USB device to dropbox? Just because you could do it with a particular drive and a particular version of dropbox in the past is no guarantee that you can continue to do it today. They are constantly updating their software and the methods they use to identify the mounted devices. Since they have explicitly stated that they don't support this (and are implicitly trapping against it) they most likely have a reason. That is most likely the reason you can no longer do it. 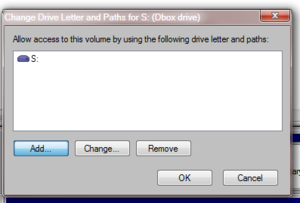 When I connect a USB drive, it automatically gets assigned a drive letter like normal. I can also access the files on the drive (and add/delete files) as a typical USB drive should function. When I say I can't "mount" a USB drive, I am referring to my original post where I go into disk management and select "Mount the following NTFS folder..."
As I stated before, this has basically nothing to do with dropbox itself. Dropbox is not necessarily the issue. The issue is that when I attempt to "Mount the following NTFS folder..." in the USB drive, I obtain the error "The parameter is incorrect" as referenced in the picture I linked my original post. I am simply trying to uncover the reason why I can no longer "Mount the following NTFS folder..." on any USB drives anymore. The process of "Mount(ing) the following NTFS folder..." DOES work on my other computers using the same USB drives, but it does NOT work on this particular laptop I have. You are trying to mount the root directory of an existing drive to an NTFS subdirectory on the same mounted drive letter. That could create a recursive link and is generally not permitted. If you Take the mounted Drive S root directory and add a new mounted folder, say C:\DROPBOX for example, it should work fine. Are you saying that I should mount a folder on my standard "C:" drive? If I understand you correctly, and I do mount a folder on the C drive, then that sort of defeats the purpose of the mounting. The reason that I'm trying to mount the folder on my USB drive is to "trick" dropbox into thinking that the mounted folder is not on a "removable drive" so that I can force dropbox to sync files to that folder. If I go through the process outlined in my previous message ("Change Drive Letter and Paths...", clicking "Add...", clicking "C:\", then creating a folder on that drive) then the files I am trying to add to that newly mounted folder would still be on my main "C" drive and not on my USB drive. Basically, I just need some clarification about what you are saying in your message. I do appreciate your time and everything you've done so far, too! I believe mwroobel is correct. 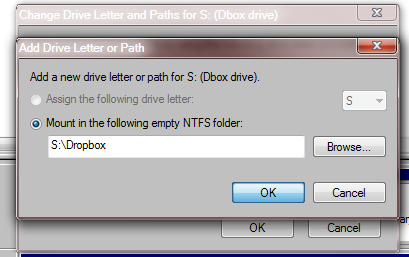 The C:\Dropbox folder that you create is simply a "mount point" that Windows uses to mount the USB flash drive on to. Thus, C:\Dropbox actually points to the USB flash drive filesystem when the USB flash drive is mounted. To prove it out, I ran a test on my computer. I'm using Windows 10, but I believe it's the same as Windows 7. I plugged in a 2GB USB flash drive into my computer. It mounted as drive G:. 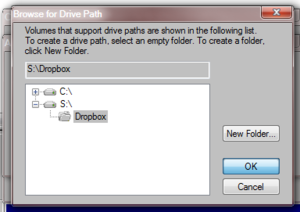 In Disk Management I followed your above method to add new path to the USB drive. I browsed to D: (my games/scratch drive) and created a new folder "Test" (D:\Test). I browsed to D:\Test, right-clicked "New-->New text document" and called it "test.txt". In addition, I could browse to G:\ and see the same test.txt file there as well, thus proving that the file was written to the USB flash drive, not to physical drive D:. THANK YOU SO MUCH!! This problem is SOLVED. I understand fully, now. I completely misunderstood the fundamental concept of mounting to a USB drive. Regarding USB drives, the concept of mounting a folder is simply creating a point on the main system hard drive that "routes" data from the main system drive to the USB drive, thereby stopping the data from being stored on the main system drive and instead storing it on the USB drive. The concept of routing data from one drive to another is the reason why my original process was failing. My original method was trying to route the contents of one drive to the same drive, which does not work. To correct my original method, after I have right clicked on my USB drive in disk management, clicked "change drive letter and paths...", then clicked "add...", I must add an empty NTFS folder ON THE MAIN SYSTEM DRIVE because that is the point at which data will be routed to the USB drive. I greatly appreciate ALL of the support I have received from you guys, and for bearing with me as I attempted to understand the concepts.